Asia continues to suffer through a severe winter that has killed hundreds. Coldest February temperatures EVER blast Mumbai, India. Mumbai, India is suffering through the coldest ever temperatures recorded for the month of February. A nail-biting cold wave is making the country’s financial capital – Mumbai – shiver. The minimum temperature in the city dipped to a season’s low of 8.5 degrees Celsius Friday. “This is the lowest-ever temperature recorded in the city for the month of February,” said K. Sathi Devi, director of weather bureau here. The minimum temperature recorded Friday at Colaba, in south Mumbai, was 13.4 degrees Celsius, while at Santacruz in north Mumbai it was 8.5 degrees Celsius. This is the coldest ever in the city of stars in the past 40 years. But the record low is 7.4 on Jan 22, 1962. 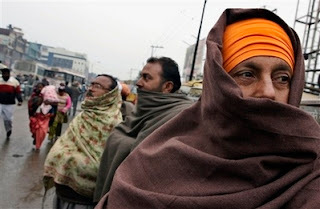 “The cold wave is expected to continue for at least another two-three days (till Sunday),” Sathi Devi told IANS. In Mumbai, the roads suddenly wore a deserted look as people preferred to stay indoors to keep warm. “I was supposed to go out for an evening jog but did not feel like leaving home due to the chilly winds blowing. It’s almost freezing,” said Riddhi Oza, an executive working for a multinational company in Oshiwara, north Mumbai.